APPLICATION: This solid state voltage regulator is specifically designed to fit Splitdorf DU model generators, including DU-1, DU-5 and DU-7 both clockwise and counterclockwise rotation. These generators were commonly used on Indian, Henderson, Excelsior and other motorcycles (except Harley Davidson) from 1918-1931. The basic circuit design is similar to that of a modern automotive voltage regulator. All internal solid state components are sized specifically for this application and are designed with a minimum 100% overrated safety factor. The regulator components are assembled onto a printed circuit board which is then housed inside a brass cap, and encapsulated in a high temperature epoxy potting compound which is impervious to water, oil or dirt and insulates the components from vibration. Four clearly labeled and color coded wires with terminals allow for easy and positive electrical connections. After installation of the Splitdorf Solid State Voltage Regulator on a properly functioning Splitdorf DU series generator, the charging rate will be variable and automatic based on demand, and limited only by the design and condition of the generator. This will eliminate the annoying problem of either overcharging or undercharging of the battery, and the guesswork needed when adjusting the third brush to change the charge rate. The original Splitdorf generator design required removing the cap and adjusting the position of the third brush in order to change the charging rate. By moving the third brush in relation to the + or – brush (depending on rotation), the voltage applied to the field windings was changed. This in turn changed the strength of the magnetic field applied to the rotating armature and thus limited the maximum charging rate, or current output, of the generator. The generator would continue to charge at this rate all the time, regardless if the battery were boiling over or dead, lights on or off, it didn’t matter (see the DU-5 Three Brush curve in the graph at the end of this section). Many batteries and fine paint jobs have suffered from this poor regulating system! 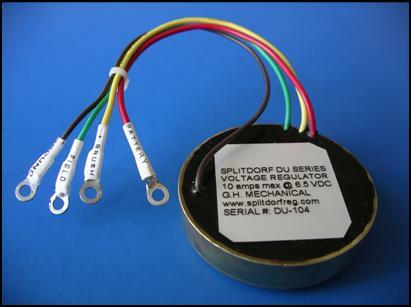 The Splitdorf Solid State Voltage Regulator requires removal of the third brush and the often troublesome cutout relay. This will allow the solid state voltage regulator to accurately control the voltage to the + side of the field windings, which will in turn control the current output of the generator. Based on the battery voltage, the generator can now charge only as much as needed. When the lights go on, generator output increases in an effort to maintain the desired battery voltage. When the lights go off, the charge rate tapers down as the desired battery voltage is obtained, then a small trickle charge is applied to maintain the battery. If the battery is low, a high charge rate will be seen until the desired battery voltage or state of charge is obtained, at which point the charge rate tapers down to a trickle charge. Depending on the condition and size of the battery, this may take some time, as the maximum output of the Splitdorf generator is rather modest. See the graph at right. Installation can be performed by the average Joe, even one who may be electrically challenged! The original cutout assembly and third brush must be removed from the generator. Depending on rotation, some generators will require reconfiguring the internal field wire connections. The solid state regulator fits neatly inside the cap of all DU series generators and is held in place with high temp RTV silicone. It is impossible to detect the regulator from the outside. Detailed installation instructions, all necessary hardware and a small packet of heat conducting paste are included. Only the small amount of high temp RTV silicone is not included. In developing this regulator, numerous prototype regulators were thoroughly tested in a series of extreme conditions on a test stand, including prolonged overload and over-temperature tests and every conceivable improperly connected situation was attempted. The only damage to a generator during testing occurred as a result of a 3 hour full load (6 amp) test while maintaining an ambient temperature of 180 degrees F around the generator. The generator failed due to excessive heat, but the regulator was removed and installed on a second unit and worked perfectly. Prototypes have also been running on a variety of machines since May of 2004. All prototypes have performed very well, with no failures to any regulators, generators or batteries as a result of installing this regulator. Every regulator assembly is individually tested at full and no load conditions prior to shipment. 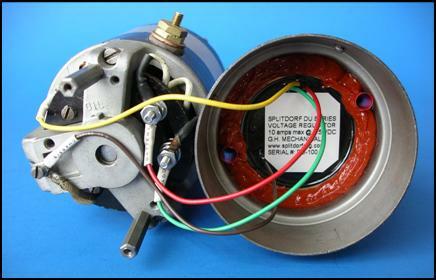 A properly working and reliable Splitdorf model DU generator. Elimination of the 3rd brush and internal cutout assembly, converting the generator to a 2 brush configuration. Gluing the regulator to the underside of the generator cap and connecting 4 wires. Solid state voltage regulator, small parts kit and packet of heat conducting paste. Detailed 8 page installation and operation booklet, including diagrams and a troubleshooting guide. Allow continuous operation of stock lighting without discharging the battery. Maintain the battery at 7.25 volts maximum with a charge rate of 0.5 amps when running with lights off. Allow the generator to be operated continuously when there is no battery in the system without damaging the generator or regulator, unlike the original, which would destroy the generator if run for any length of time with no battery in the system. Eliminate any problems associated with the original style cutout (either electrical or centrifugal type), since it is replaced by an internal diode in the new regulator circuit. Be virtually impossible to detect from the outside, unless observing the ammeter while running the engine. Extend the battery life considerably, assuming you have a good battery to start with and it is given reasonable care. Fix a poorly or non-functioning generator. You must have a properly functioning generator before installing the regulator! Make up for a dead or weak battery. Get a good battery and take care of it! Allow the operation of lights and charge a low or dead battery simultaneously. Allow the generator to produce any more power than it was originally rated for, other than for very short periods of time, without damaging the generator or regulator. Therefore, this means that you are stuck with the stock lighting equipment that was on your motorcycle originally. Don’t expect this regulator to allow the old Splitdorf generator to power a halogen light, because all it will do is drain the battery and overload the generator, possibly destroying both in the process!